While Brewster has only bay beaches, Harwich has only ocean beaches along Nantucket Sound (aside from the freshwater beaches). To park at the beaches, you will need a beach sticker. Here are the beaches of Harwich. Bank Street Beach. Located off Bank Street (off Route 28), this beach is quite popular. The waters of Nantucket Sound are warmer and calmer than the ocean waters of the Outer Cape. This is a good beach for swimming and sunbathing, as well as for watching boats and collecting seashells. There are restrooms at this beach and there is a lifeguard on duty. The ice cream man stops here. Red River Beach. Located off Uncle Venie's Lane (be sure NOT to take Red River Road - it is a dead end), this beach is quite popular and has plenty of space to accommodate visitors. The waters are good for swimming, as well as kayaking, windsurfing, and other water activities. There is also a boat ramp at the very end of the parking lot. There are restrooms and a lifeguard on duty. The ice cream man stops here. Earle Road Beach. Located at the end of Earle Road, this beach has small rock jetties, nice water, and is a great spot for finding shells. This beach tends to be quieter than other beaches, so it is a nice spot to spend a day with a good book. There are restrooms here and a lifeguard on duty. Grey Neck Beach. Located at the end of Grey Neck Road, this small beach is a quiet spot to get away to. There are stairs down to the beach, so this can be a hard beach to get to if you are disabled or have trouble with stairs. There are no lifeguards or restrooms here. Pleasant Road Beach. Located at the end of Pleasant Road, this large beach is popular with families who want to spend a day enjoying the surf and sand. There are plenty of shells to find here. There are restrooms and a lifeguard on duty. Pleasant Bay Beach. Located at the end of Bay Road on Pleasant Bay (near the border with Chatham), this beach is nice for a dip and spending time with the kids, but there are no lifeguards or restrooms. Sea Street Beach. 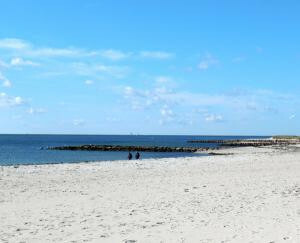 This beach has only two parking spaces, but is easy to walk to from the center of Harwich Port. The beach is small, but the water is very nice. There are no lifeguards or restrooms here. There are also a few Harwich beaches which are public, but have walking access only (and there are no lifeguards or restrooms). These are Belmont Road Beach, Brooks Road Beach, Merkel Road Beach, and Neel Road Beach. There is a lot of space on the sand and jetties at Red River Beach in Harwich. Photo by Jane Booth.